When McDonald’s decided to give away bottles of its Big Mac Special Sauce, you could already picture these containers of yellow-ish condiment ending up for sale on the secondary sauce market. So it comes as little surprise that folks are selling their Special Sauce on eBay. 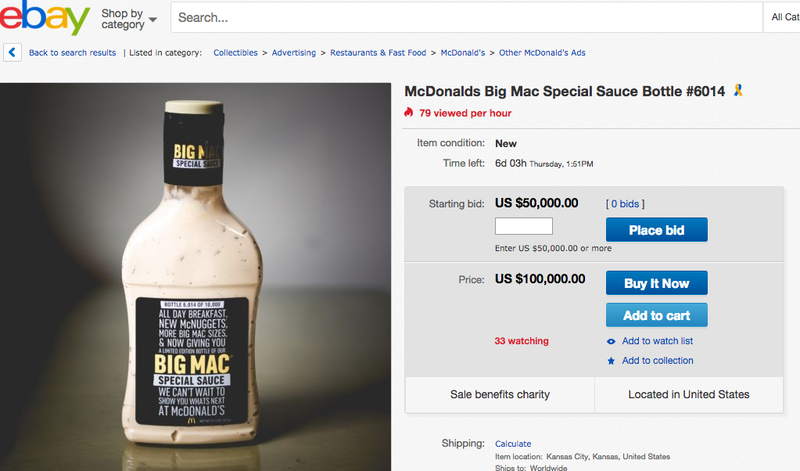 Just one day after McDonald’s gave customers the opportunity to score one of 10,000 free bottles of Big Mac sauces, the coveted condiment has made its way to the cyber auction block, in some cases, for outrageous prices. For now, there are 376 listings on eBay under the search for “big mac sauce,” although the results also include other Big Mac paraphernalia like toys or old boxes. The bottles range in price from $0.99 to $50,000 — or $100,000 for a “Buy It Now” price. The cheapest bottle is currently sitting at $0.99, but still has two days left in bidding. The poster notes that the bottle has been refrigerated since it was obtained, and will ship overnight for free. This isn’t the first time Big Mac sauce has made it to eBay. Last year, in conjunction with a giveaway in Australia, a limited-edition 500-milliliter bottle was auctioned to raise money for Ronald McDonald House Charities. McDonald’s announced earlier this week that it would host its first giveaway of the Big Mac sauce in the U.S. as a promotion for its new smaller and larger sized version of the sandwich. In all, McDonald’s handed out 10,000 numbered bottles of the sauce on Thursday to customers who waited in line at select locations around the country. If you didn’t score a bottle yesterday and you don’t want to buy from a stranger on eBay, McDonald’s says it will auction off an extra bottle of the sauce today. The auction, which runs until 8 p.m. ET, is currently at a bid of $750. All of the proceeds will go to benefit the Ronald McDonald House Charities. Of course, you don’t have to shell out the big bucks to get your hands on the sauce. Back in 2012, the company’s executive chef demonstrated in a YouTube video just how you can make the iconic sauce yourself.